Certainly one of Vernon's most distinctive buildings the structure first called 'The Library' and later 'The Office' was at the center of Talcottville on the corner of Main and Elm Streets, where the church parking lot is currently located. 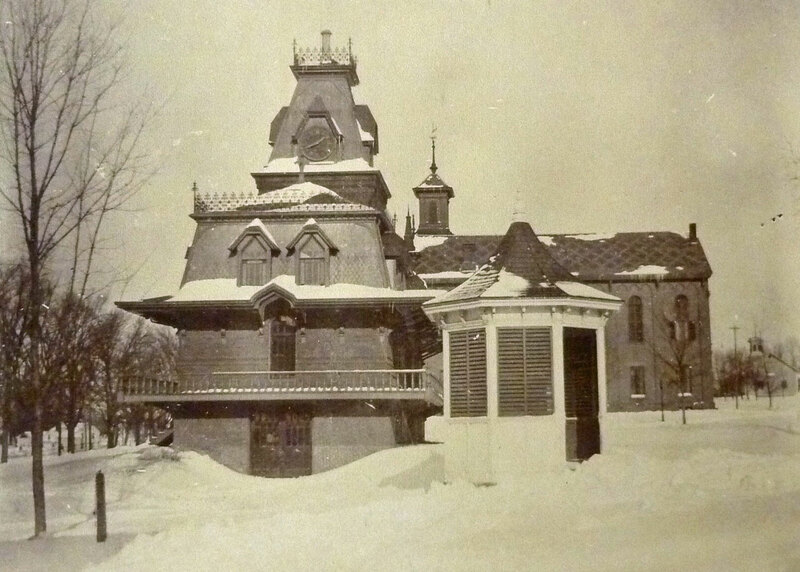 This spectacular old building was built about 1880, the same time frame as the Talcott houses and the old church. It survived to the modern era when it was regrettably torn down. Constructed by the Talcott Brothers, this Victorian Lady originally had two rooms for a library and museum for mill families. At the time it was not unusual for mills to house libraries for workers and the Rockville Public Library wasn't built until 1893. 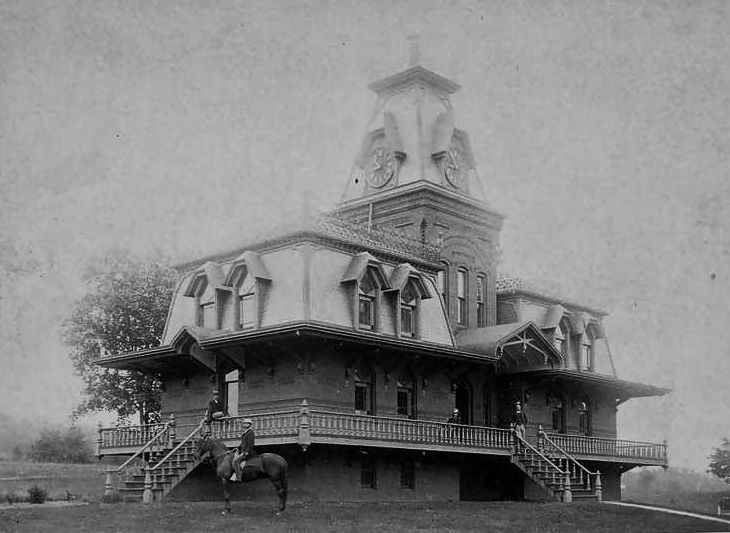 After the first Talcottville church burned in 1908 and the Rockville Public Library was available, the Talcott Brothers moved the mill's office into this building. In the early 1900's, the building was also home to the Talcottville Fire Department, which was run by volunteers from the community. Stories abound about the fire engine, the most modern in the area, that was kept there, and the role it played. After the church fire in 1906 the building became the Talcott brothers' business office and thus became known as 'The Office.' Their office was previously located on the first floor of the church. In front of the building during the early 1900's was the Talcottville Trolley Station which can be seen in old photos. Terry Coulombe, who grew up in Talcottville in the 1940's and 1950's, remembers, "The Office was very impressive in those days! We still lived in 'mill housing' and would go up to the Office to pay rent and other bills. In later years some of the rooms were used for Sunday School classes. When I went out to play after school, I would be told to look at the office clock in order to know when to come home for supper." As the Victorian lady aged she began to decay. At some point her grand porches were removed. In the 1960's the Talcottville Congregational Church bought the building from the Talcotts for $10,000. At this point it was obsolete and impractical for any use. George Risley of the Talcottvlle Construction Company agreed to demolish the building for $1 if he could keep the clock and the bricks, which he planned to use in the Golfland buildings. Both the clock and old style bricks were incorporated in the new buildings. 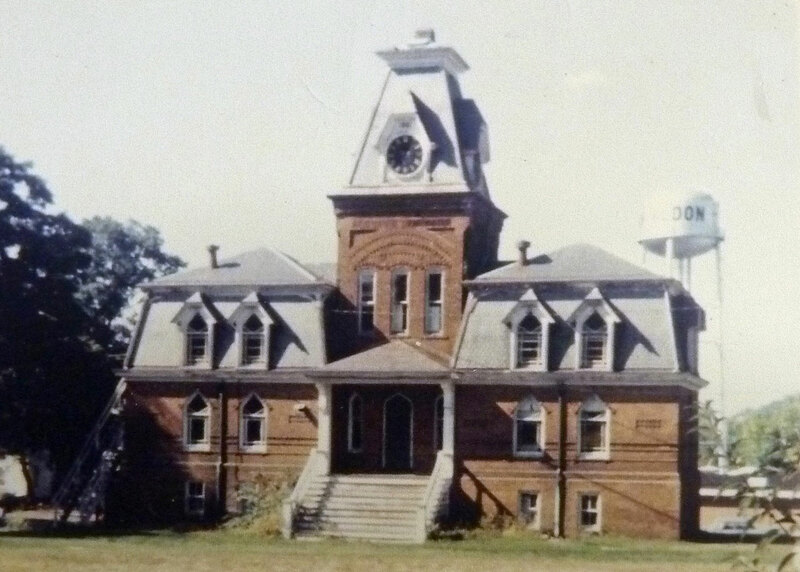 The building came down in 1968. About 1895. 1901 office in the church. About 1952 without porch. The solid brass works clock was manufactured by E. Howard & Co. from Boston, Massachusetts. 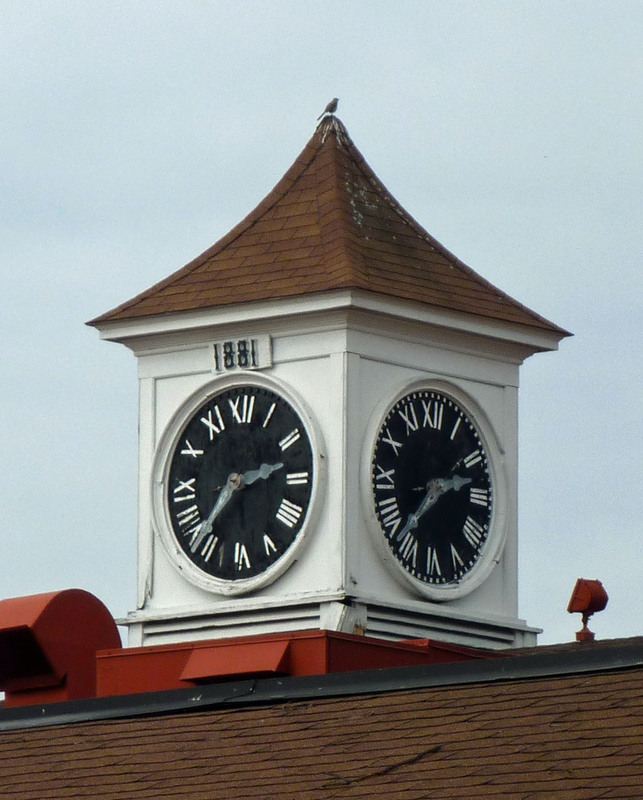 Records show that firm shipped a tower clock to Talcottville sometime between 1879 and 1885. The clock works and gears weigh about one ton and are about 30 inches high with a pendulum swinging 10 feet below. The clock is powered from a box of stones hanging from a cable, which could be slowed down by removing stones. It was 'wound' when the box of stones was lifted back up each week. For many years this duty was perfomed by GAETANO SIMONCELLI, who was also the postmaster of the Talcottville post office and lived next to the Office. This magnificent four faced tower clock was saved, and is still in Talcottville. At the time the building was demolished the wooden faces had weathered and were crumbling. Risley had four new faces made by TED HIETALA of Coventry, a carpenter in Risley's woodworking shop. 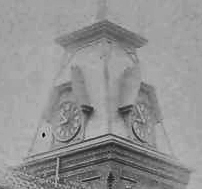 Hietala also made the new face on the clock on top of the First Congregational Church in Vernon Center. It was then moved to the cupola in the hotel and restaurant across the street, what was formerly The Colony Restaurant & Conference Center. Note the 1881 date. 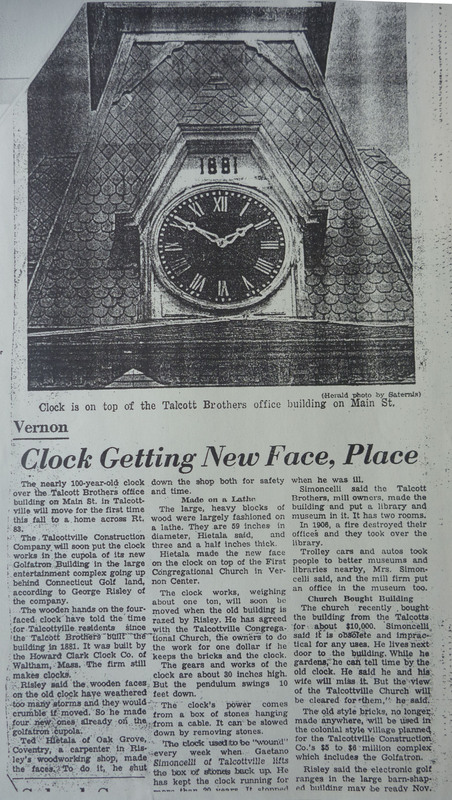 Manchester Herald, October 16, 1967, Clock Getting New Face, Place.